The bald eagle is a type of sea eagle with the scientific name Haliaeetus leucocephalus. It is most famous for being the national bird and symbol of the United States. Bald eagles have brown feathers with a white head, a white tail, and a yellow beak. They also have large strong talons on their feet. They use these to capture and carry prey. Young bald eagles are covered by a mixture of brown and white feathers. The bald eagle has no real predator and is at the top of its food chain. How big are Bald Eagles? Bald eagles are large birds with a wing span of 5 to 8 feet long and a body that ranges from 2 feet to just over 3 feet long. The females are larger than the males and weigh around 13 pounds, while the males weigh around 9 pounds. They like to live near large bodies of open water like lakes and oceans and in areas that have a good supply of food to eat and trees to make nests. They are found in much of North America including Canada, northern Mexico, Alaska, and the 48 United States. The bald eagle is a bird of prey or raptor. This means that it hunts and eats other small animals. They mostly eat fish such as salmon or trout, but they also eat small mammals like rabbits and raccoons. Sometimes they will eat small birds like ducks or gulls. They have excellent eyesight allowing them to see small prey from very high in the sky. Then they make a diving attack at very fast speeds in order to capture their prey with their sharp talons. Is the Bald Eagle endangered? Today the bald eagle is no longer endangered. At one time it was endangered in the continental United States, but recovered at the end of the 1900s. It was moved to the "threatened" list in 1995. In 2007 it was completely removed from the list. They aren't really bald. They get the name from an old meaning of the word "bald" due to their white hair. 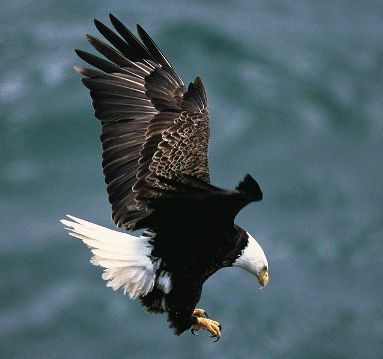 The largest bald eagles tend to live in Alaska where they sometimes weigh as much as 17 pounds. They live around 20 to 30 years old in the wild. They build the largest nest of any North American bird. Nests have been found that are as deep as 13 feet and up to 8 feet wide. Some bald eagle's nests can weigh as much as 2000 pounds! The bald eagle is on the seal of the President of the United States. 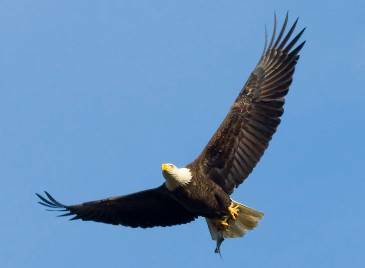 Bald eagles can fly as high as 10,000 feet. Cardinals - Beautiful red birds you can find in your backyard. Mallard Ducks - Learn about this awesome Duck! Ostriches - The biggest birds don't fly, but man are they fast.